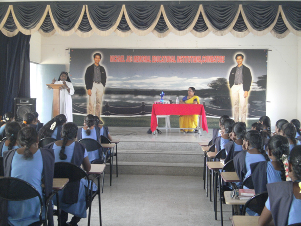 As a part of the student development programme of the Michael job College of arts and science for women on 12th February, 2016 Dr Vijayalakshmi organised for guest lecture by Sister Maria Thersa, Principal, St. Joseph Higher Secondary School, Karumathampatti. Sister. Maria Thersa gave a motivating lecture to fill the young minds with aspiration. She explained the importance of Self Motivation and Self Confidence as essential ingredients for success. The session was very interactive and to make the session interesting she asked some questions on general knowledge to the students. She give presents to the students who answered the questions correctly. The children enjoyed this session very much and we are very thankful to Sister Maria for sparing her time and exposing our children to many ideas. Collection song Dangdut Koplo Orkes Live, traditional song from java.